You probably know Aden & Anais for their beloved swaddling blankets. Now they have just launched a line of crib sheets in the same fabrics and gorgeous prints. 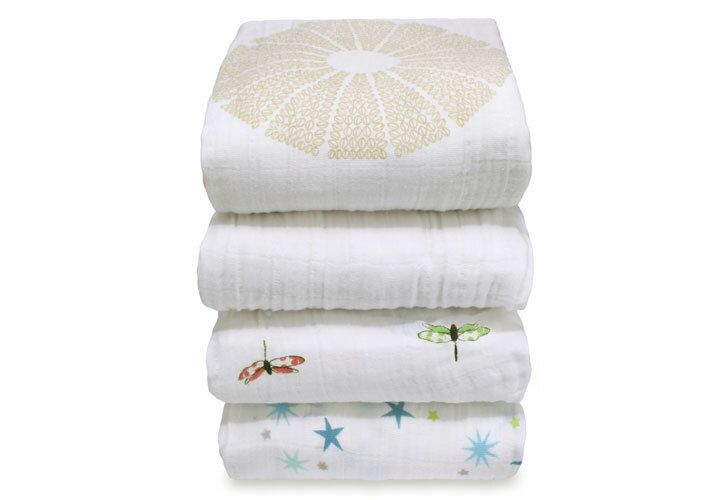 Choose from four pretty organic cotton muslin crib sheet options including solid white and a fun dragonfly print, or pick from seven muslin crib sheets in solid colors or patterns including stars and super-cute flying dogs. Why is muslin cotton so great for crib sheets? Not only is it soft, yet strong enough to handle lots of machine washings, it’s also a highly breathable fabric, which is important for Baby’s crib. You probably know Aden & Anais for their beloved swaddling blankets. Now they have just launched a line of crib sheets in the same fabrics and gorgeous prints. Choose from four pretty organic cotton muslin crib sheet options including solid white and a fun dragonfly print, or pick from seven muslin crib sheets in solid colors or patterns including stars and super-cute flying dogs.�Why is muslin cotton so great for crib sheets? Not only is it soft, yet strong enough to handle lots of machine washings, it's also a highly breathable fabric, which is important for Baby's crib.